Although Mavericks (OS 10.9) differs from previous OS upgrades in being free and more readily installed “over” existing systems, users can still benefit from adequate preparation, from planning, from a thorough understanding of Mavericks’ benefits (and possible pitfalls) and from access to a rich set of resources to make the most of it. 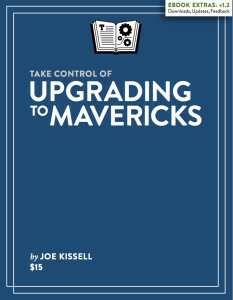 Experienced Mac author Joe Kissell’s ebook, Take Control of Upgrading to Mavericks, provides all of that – and more. At first sight, it’s hard to imagine how the installation of an operating system that “just works” warrants 176 pages. But after even a few minutes spent with the ebook (it’s a nearly 3MB download, and can be updated from the ebook’s website as additional material is added), it becomes clear that it does. The ebook has almost two dozen major chapters (a sample can be downloaded here). They lead you through the whole process. From why to upgrade in the first place to solving problems, migrating to another Mac and OS X Server once you’ve finished. You’ll find the ebook eminently easy to use thanks to its layout, use of white space – and consequent absence of density and crowding – intelligent and consistent font conventions, color, alternatives/choices through lists and so on. Detailed though the material may have to be, Kissell invariably presents it in an uncluttered and accessible way. He makes frequent use of screenshots, of links within the text; and above all algorithm-like numbered step-by-step instructions which are refreshingly unambiguous and take you through what really happens, rather than a recipe of what is meant to happen. Joe Kissell’s style of writing is extremely clear and unambiguous. He anticipates the vast majority of questions you’re likely to have and answers them by setting out steps in a way that’s very easy to follow. He explains why, how and when to perform each step, diagnose each on-screen message, understand each dependency, prepare for each situation and clear away or delve into the many options that crop up, for example, before during and after the actual installation process you choose (for most it will be “Install in place”). It’s reassuring, for instance, to be told that Safe Boot is no longer necessary – and why. That iTunes authorizations are not lost. How not to panic if the process takes hours (or even longer if you have a slow internet connection). That the first time you use Mavericks, OS X Setup Assistant runs – though it looks as if the actual installer is still running. And not to forget to turn Sleep and automatic backups off before beginning the install – as well as to make a copy of Take Control of Upgrading to Mavericks itself (!) It’s hard to think of a constituency of Mac users which will not benefit in one way or another from this ebook’s thorough, authoritative and accessible approach. Of course it’s not always possible (or feasible) to do things exactly as the default advice from Apple imagines you will be able to. Kissell is ready at almost every turn with alternatives. He explains or suggests what those without broadband can do to get the large download. How to make a bootable Mavericks volume. What your options are when choosing destination volumes for the install – and why. He explains the rationale behind, and intelligent responses to, Apple’s Incompatible Software routines. How to navigate the prompts and options with which the new installation will present you… Apple ID, Accessibility, Spotlight, Find My Mac etc. Sitting in front of a machine that’s just undergone such trauma isn’t the time to have to scramble for such answers. Kissell’s exhaustive approach comforts by suggesting ways around what could otherwise seem unsurmountable road blocks. The sidebar on page 129 explaining how quickly to recover an apparently missing User folder (!) is a good example. When you consider that Kissell’s coverage of actually installing Mavericks itself (whichever form you choose) takes no more than a quarter of the ebook (38 of 162 substantive pages), you see what good value this product represents. You should come away with as thorough an understanding of the background, essence, changes, advantages, potential worries, solutions, optimization, options, ancillary processes (like backing up) – as well as guidance to finding other relevant resources as is currently available anywhere even though there are sites and sources which cover the area. This ebook has amalgamated it in an extremely good way. Then you’ll be led through the “loose ends” of changes to Mail, the iCloud keychain, iBooks migration, enhanced dictation and the other new aspects of 10.9. There are half a dozen pages devoted to other such “surprises” as changes to Apple software, including Messages; to multiple displays; Labels and Tags; System Preferences; syncing and the alerts you’ll get the first time you run some software. There are many decisions to be taken during such a process as a major upgrade – not least is which method to employ in the first place. But also on security, inclusion or not of Java Runtime, Migration of data and third party compatibility. It’s here that you feel Kissell’s experience and expertise to be at its most helpful and useful. Since he’s trusted so much, so are his judgements; and rightly so. Though he always explains pros and cons and helps us to reach conclusions that (will) work for us. 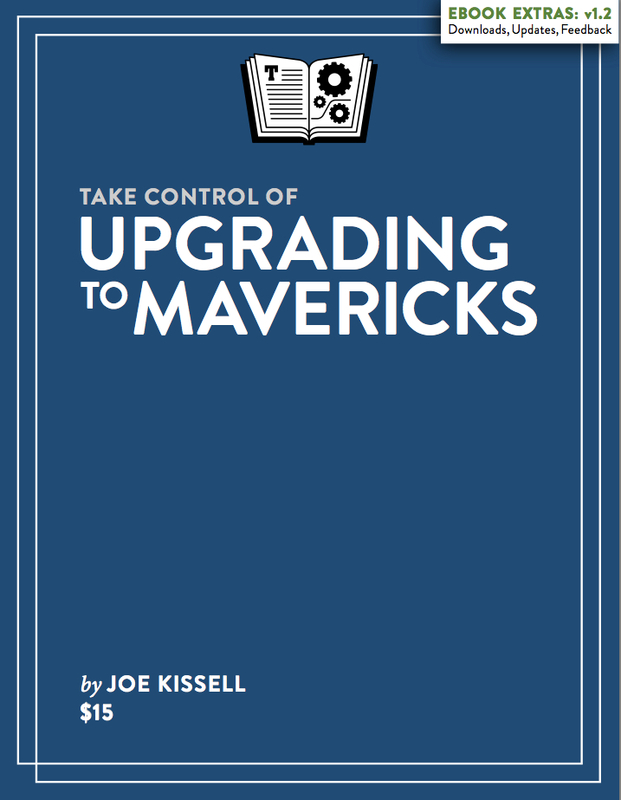 Take Control of Upgrading to Mavericks is the definitive guide to obtaining, preparing (for), installing, configuring and – potentially – troubleshooting Apple’s latest desktop operating system, Mavericks. Even seasoned and expert upgraders will want to have this well-written, current and comprehensive resource available. Pros: comprehensive; up-to-date; authoritative; realistic; well-structured; easy to read; thorough.